(TibetanReview.net, Feb09, 2018) – Ahead of the 59th anniversary of the Tibetan National Uprising Day on Mar 10, 2018, about a dozen cyclists made a tour of Taipei on Feb 7 morning to raise awareness and solicit participation in the annual March rally to commemorate the occasion. 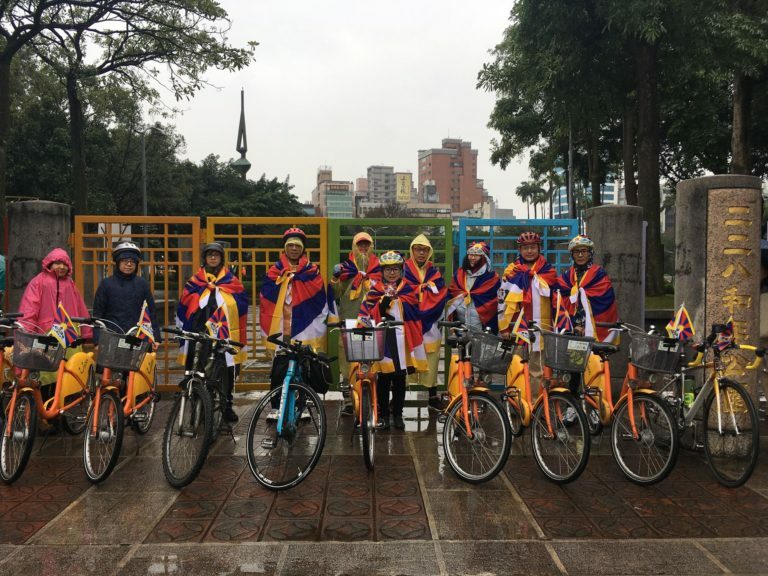 After gathering at the 228 Memorial Park, the group, made up of Tibetan and Taiwanese cyclists, set off on a route that passed by the National Chiang Kai-shek Memorial Hall’s Liberty Square and Taipei 101. They shouted calls for Free Tibet and demands for the Dalai Lama, Tibet’s exiled spiritual leader to be welcomed back to his homeland. Representatives of Taiwan’s Legislative Yuan member Kolas Yotaka and heads of a number of NGO’s also addressed the press, expressing support for the human rights of Tibetan people.